It's that time again - time for empties. Last month I didn't have a whole lot of empties as I had just moved. This month I think I've used up a few more things. A lot of things were on the verge of being used up last month, and they've sneaked into this month. Either way, a chance to restock. All of the products I used up last month. I think I actually used this up the month before, but as I moved houses, it didn't make it into last month's empties. Either way it doesn't matter too much. I loved this day cream and I was a tad disappointed when I ran out. I wrote a small review of this cream here. Would I repurchase? Probably after trying other day creams first. I am a big fan of Bioderma to remove my makeup. I think I also finished this one up the month before last, but again, it didn't make it to last month's empties. I love this stuff, and have for a while now. You can read my rave here. Would I repurchase? I like to try lots of other variations but yes, I would repurchase. I've had this one in my collection for a while now, but decided a few months ago to start using it. I actually fell in love with how soft and gentle it was on my face, whilst still feeling gritty enough to be actually doing something. Sad to see this one go, but I have a few scrubs ready to try out now. Would I repurchase? Probably after trying a few others. I think it was safe to say I was as tad stressed out about moving houses, our Bloggers United AU Event in Brisbane and the rest of it all. I had purchased this body wash a while ago to qualify for a gift with purchase, but have used it in the past so I had to whip it out to use last month. Would I repurchase? Yes, at some stage. This is mostly for my partner but I use it every now and then too. I especially love using it just after I've shaved, as it makes my skin feel smooth and a little tingly. This is the small conditioner that comes with the John Frieda hair dye packs, however you can also buy this in a full size. I have so many of these minis lying around, that I just continued to use up the mini I took with me to Brisbane before starting a new full sized version. Would I repurchase? Yep, always. I got these as a deluxe sample in one of the skincare bag gift with purchases from Priceline. I have tried Wotnot before and to be honest I haven't been all that impressed. I've tried other cheaper brands that get the job done. I know these are natural and organic though, which is probably why they are slightly expensive. Would I repurchase? Probably not as I rarely use makeup wipes anymore. Ohhh yes the wonderful makeup pads. 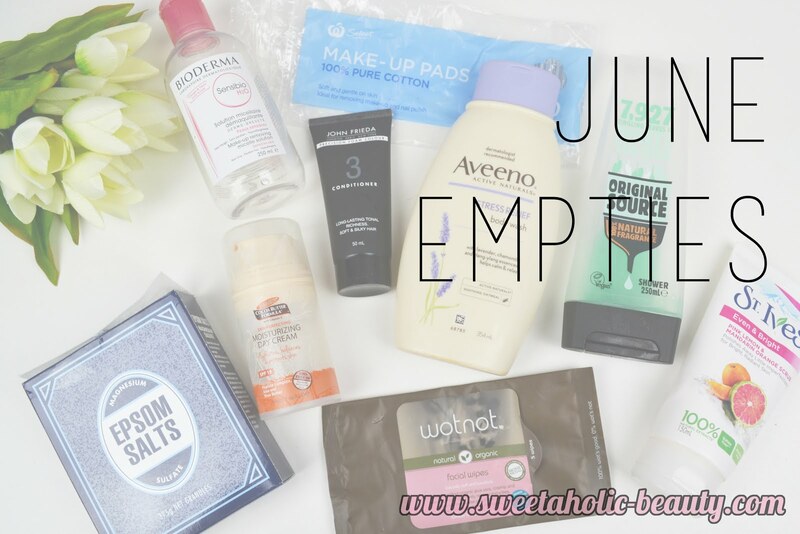 I use these like they're going out of fashion and I think they've been in almost every single one of my empties posts since I started realising how awesome they are. Would I repurchase? Yes, yes and yes. As I mentioned earlier, I was stuck at home in bed for the better half of last month as I hurt my back pretty badly. I ended up having an Epsom Salt bath and I have to say it really did help loosen my muscles. Would I repurchase? If I'm feeling sore again, then definitely. So there you have it, all the products I've used up last month. It never seems like enough when I'm stacking it all up to photograph but as soon as I begin writing it, I realise I've actually used up heaps of stuff. Have you tried any of the above products? If so, what are your thoughts? Have you used up any products this past month? 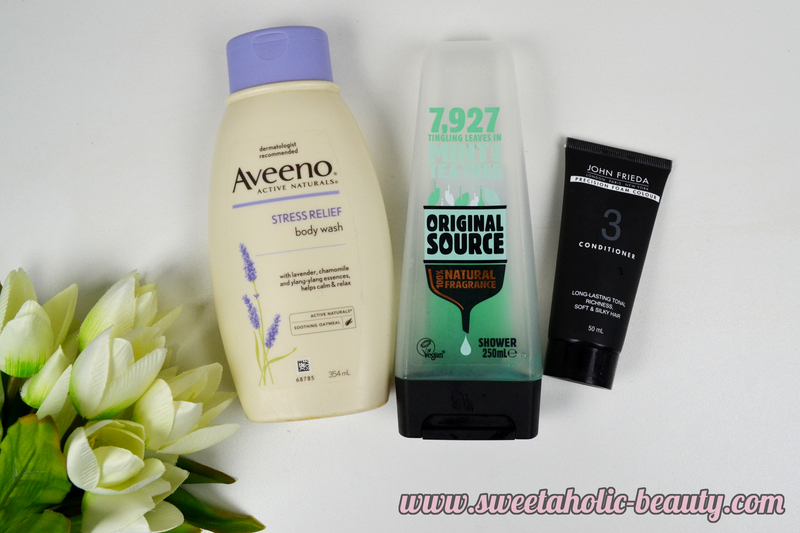 I like that John Frieda conditioner too! It's good on my hair. 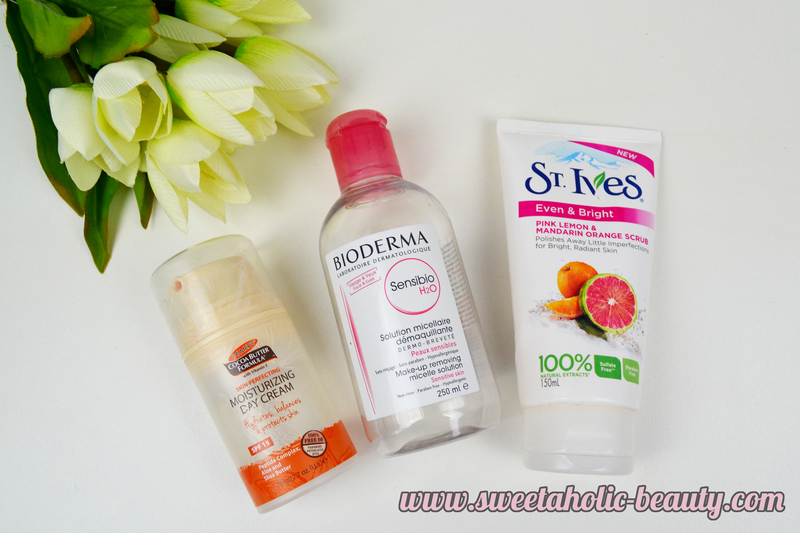 I absolutely love the Bioderma Micellar Water and I'm sad I finished mine lol. Love the sound of the mint and tea tree shower gel! I do like the WOTNOT facial wipes but if you do leave the packet slightly open, they dry out easily (as I discovered recently when I went to use an almost empty pack of them). 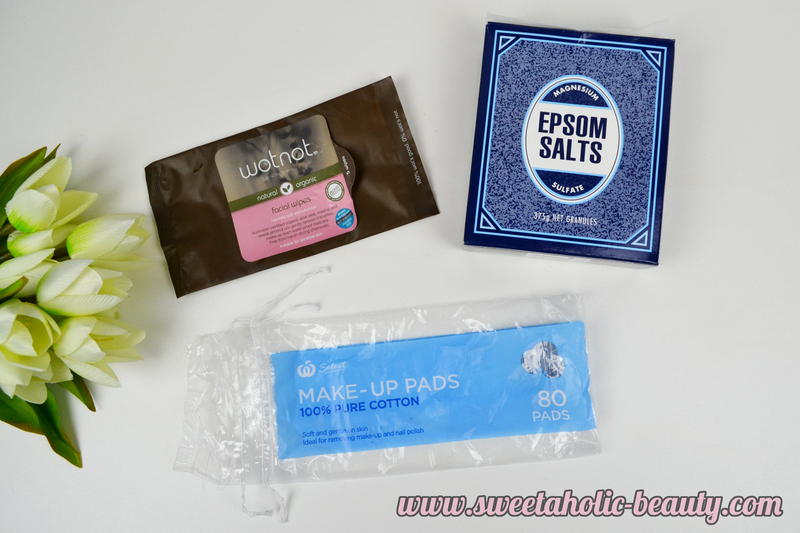 Epsom salts are great for relieving muscle aches! 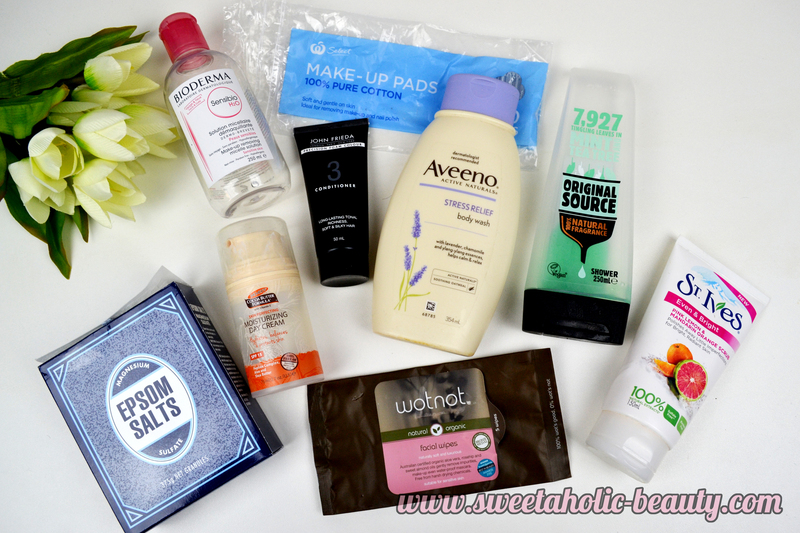 I love seeing what other bloggers use up during the month. I am addicted to St. Ives scrubs so I definitely need to try this one.